A Blidworth man launched a tirade of abuse at his neighbour who called the police when he argued with his wife in the early hours, a court heard. Jason Davies and his partner were rowing outside their home on Hillside Road, on October 14, when his neighbour asked what was happening. Prosecutor Sarah Sanderson said he began shouting obsecenities and threats that were recorded by the 999 call. 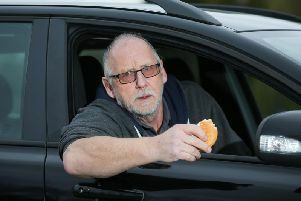 Michael Little, mitigating, said Davies, a long-distance lorry driver, of previous good character, became annoyed by his neighbour’s intervention. He said Davies was a friend of the woman’s ex-partner and had taken his side when they split, but unfortunately he and his family were moved into the house next door. “He told police that whenever something happens on the street his neighbour gets involved,” Mr Little added. He said the ex-Royal Artillery man, who has been diagnosed with post-traumatic stress disorder, lost his temper but later apologised. Davies, 39, of Hillside Road, admitted using threatening and abusive words, when he appeared at Mansfield Magistrates Court, on Friday. He was fined £400, and was ordered to pay £85 costs and a £40 government surcharge.